a. Lucky Draw for priority registration (Cart 1 and Cart 2): For all customers who have made a good deposit 100 million VND reserving priority registration right for purchase of apartments in HAWAII and VENICE blocks from 09:00 AM on Dec. 4th ,2017 to 05:00 PM on Dec. 14th ,2017.
b. Lucky Draw for bonus gifts: all customers who have paid 100 million VND on December 17th ,2017 and are successfully complete priority registration procedure for opening apartments listing in the carts of Hawaii & Venice blocks. (*) LUCKY DRAW FOR BONUS GIFTS: held at the end of the event to select the luckiest customers winning bonus gifts: (1) Mazda 3 Sedan car; (2) Complete furniture fit-out package; (3) Electrical equipment package; (4) Management Fee package for 12 months. 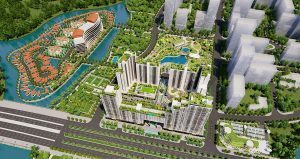 – Each customer can reserve priority reservation right for unlimited number of unit apartment by deposit of 100 million VND/ unit, and one customer can reserve for different apartments but each apartment can only register for total maximum 5 customers/ unit. – Each booking slot corresponding to 1 ticket in Lucky Draw for Cart 1 priority registration program. Customers when completing the deposit procedure of 100 million/ unit will receive an invitation card and a lucky draw ticket. Customer will preserve the ticket to vote in the draw boxes prepared by Organizer on Dec. 17th ,2017 event. – Customers should be present at the event by time and place mentioned above and must carry the ticket (**) received when paying 100 million to participate in the draw. – Customers who do not participate in the event can authorize other people to participate in the draw, but must inform the Organizer in writing. – Any absence, without prior notice or non-mandatory or non-mandatory in writing, will not be eligible to participate in the draw. – A valid lucky draw ticket is the ticket Part that is correctly put in the correct number of draw box of the selected apartment. – An invalid ticket: is the wrong ticket Part to go to the wrong number box of the selected apartment due to lucky draw regulations. – Part 3: used to check the ticket’s parts when necessary. Customers should keep carefully Part 3 to confirm identification information when necessary.